We’ve got a new project on the farm. Or is it a new pet? The kids aren’t sure which. So far it isn’t a new chore anyway, so they’re happy about that. Just when we were thinking it was getting a little late in the season to get bees, I found a guy in “town” 45 miles away that was selling an established hive–box, bees, and everything. One way to start bees is to build or buy a beehive and then purchase (mail order style) a group of bees with a queen. Then you move them into your new hive and they get busy building their home. 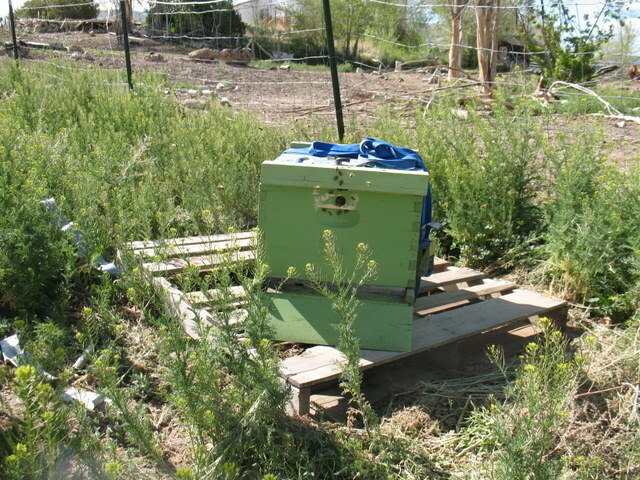 This is initially what we were looking at doing, but when this guy had a whole hive setup that had overwintered twice already and is well established plus extra boxes we can add to the hive for sale, we opted for the little more expensive but much more time and novice friendly route and just bought the whole setup from him. So we are now the proud owners of a hive of honeybees and an additional hive with slats already established to add on. Right now it is just sitting on a pallet, but eventually sweet husband wants to get a nice cinder block base for the hive that will raise it up a bit more. And now comes the fun part of figuring out things like how much honey will the bees need for the winter and how much can we harvest, where to get a bee hood, smoker, etc. for getting the honey, and how do we get the honey separated from the wax comb? Maybe we need a book on bees or something. Anyone with some great bee advice is welcome to send it my way! In the meantime, the bees are happily doing their thing at the back side of the field and unless you’re right near the hive you wouldn’t even know it was there. Looking forward to some home grown honey. We’ll see how this project goes, but so far the whole hive is nicely low maintenance. Jayme keeps bees, she may be able to steer you in the right direction. You will need an extractor to spin the honey out of the comb. You may be able to get another beekeeper with equipment to do this for you. You will need a capping knife to slice open the capped honeycomb too, then it is inserted into the extractor and spin!! There are old time extractors that you spin with a handle. My son in law is a full time beekeeper. I found Linda’s bees http://beekeeperlinda.blogspot.com/ very helpful. It follows a woman starting her first bee hive in Georgia. She is now a master beekeeper but still very helpful. Excellent. As someone who has often thought about keeping bees but haven’t acted on it, I’m interested in hearing of your progress. Keep us posted. Contact your local county extension office to get bee info & inquire who to contact for the local bee club. Dandant, Brushy Mountain, Kelley are companies to contact for supplies. Congratulations on your find! Personally, I’m afraid of bees in general, but the honey might be a motivator to get over it. Congratulations on the honey bees! You couldn’t have picked a more rewarding activity. 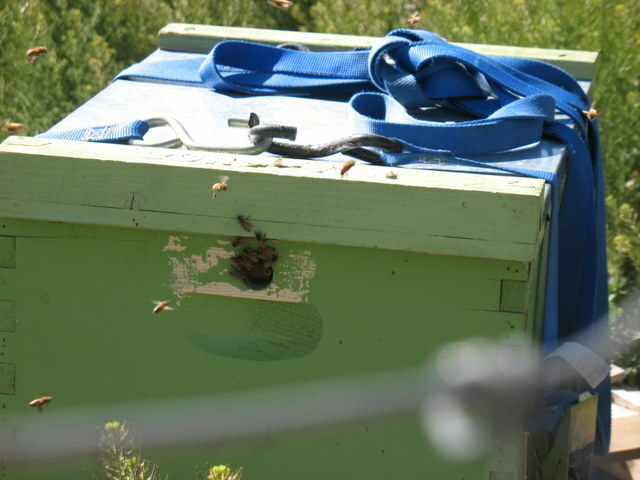 One thing to keep in mind since it is a 2-year old hive, as soon as you can get involved in a local bee association, you might want an experienced bee keeper to check the laying pattern of the queen to make sure she’s not starting to slow down. Some bee keepers like to re-queen every year to keep a strong colony. A great resource is a book called “Hive Management” (A seasonal guide for beekeepers), by Richard E. Bonney. (ISBN #978-0-88266-637-2). All the best to you and your bees! How fun! We are hoping to get some property in the next year and beekeeping is on the list of projects!